Investing in the blockchain industry is a relatively new phenomenon. Here’s a look at how to get started on investing in blockchain ETFs. Cryptocurrency investors have had a real rollercoaster in the last year or so. The likes of bitcoin, ethereum and ripple have all reached incredible highs and then crashed, and investors have seen big gains and big losses. The cryptocurrency space remains volatile but exciting, and many are interested in how to enter and make money in this developing sector. However, depending on how you look at it, perhaps an even bigger story is blockchain, the technology behind cryptocurrencies. Blockchain is the mechanism by which digital currencies are “mined” into existence, and it has become a popular investment in its own right for savvy investors. Case in point — a range of blockchain technology stocks have emerged, and large companies like IBM (NYSE:IBM), Microsoft (NASDAQ:MSFT) and Toyota (NYSE:TM) have invested in blockchain. These corporations see the potential for blockchain to play a role in driverless vehicles, food safety and more. For those newer to the space, deciding on a specific company to invest in may seem overwhelming, especially with the current uncertainty in the market. That’s where ETFs come in. In simple terms, ETFs, or exchange-traded funds, are marketable securities that track an index, a commodity, bonds or a basket of assets like an index fund. ETFs trade like a stock, and each ETF owns its underlying assets, dividing them up into shares that are available to investors. While blockchain investing is new compared to most other industries, more and more investment opportunities are opening up in this space. Below we run through the latest blockchain ETFs in descending order based on net assets. Bear in mind that none of them are pure-play blockchain funds — all of them have other technology holdings and are not solely focused on blockchain. First on our list of blockchain ETFs is the Amplify Transformational Data Sharing ETF. It launched in January 2018 and has had its share of ups and downs. It is an actively managed blockchain ETF, which makes it stand out against the other ETFs on this list. Amplify has 53 holdings with an expense ratio of 0.9 percent, and its net assets under management stand at $160.65 million. This blockchain ETF has 65 holdings, with a total of $102.93 million in net assets under management. The fund has an expense ratio of 0.68 percent. Next on our list of blockchain ETFs is First Trust Indxx Innovative Transaction & Process ETF. 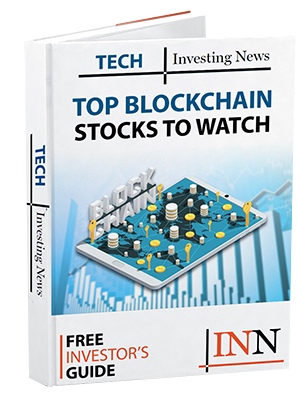 It is another blockchain ETF that launched in January, and is a passive index fund. First Trust made this choice this deliberately because it does not believe that anyone is currently adequately qualified to lead in the blockchain space given that it is such a new industry. First Trust has two types of companies it selects for: blockchain users and blockchain developers. These include companies like IBM and Microsoft. The fund consists of 84 holdings, with $29.94 million in net assets under management. This blockchain ETF has an expense ratio of 0.65 percent. Harvest Portfolios Group’s Blockchain Technologies ETF was the first Canadian blockchain ETF to hit Bay Street. The ETF began trading in February 2018 as cryptocurrencies trended downward; at the time, Harvest said it was not fazed because blockchain technology is its ETF’s main focus. The fund has 22 holdings, with 57 percent of its holdings being emerging blockchain holdings, 42 percent being large-cap blockchain holdings and the remainder being cash and other assets and liabilities. The ETF has an average dividend yield of 0.62 percent, and $12.1 million in net assets under management. Its management fee is 0.65 percent. Last on our list of blockchain ETFs is the Innovation Shares NextGen Protocol ETF. It is yet another blockchain ETF that launched in January. This blockchain ETF is also an index, and it selects its holdings based on their suitability in four categories: mining enablers, cryptocurrency users, solution providers and cryptocurrency payees. In total the fund has 48 holdings. Innovation currently holds $7.87 million in net assets under management, and its expense ratio is 0.65 percent. Which of these blockchain ETFs would you invest in and why? Tell us in the comments. And let us know if you think we’ve missed a blockchain ETF that should be included in this article. This is an updated version of an article first published by the Investing News Network in 2017. Securities Disclosure: I, Amanda Kay, have invested in bitcoin.